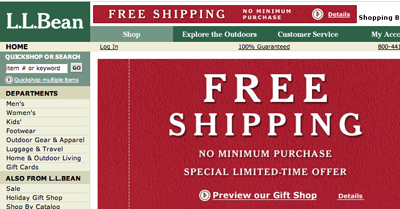 LL Bean has raised the bar on Internet shopping by offering free shipping with no minimum purchase on all but the biggest, heaviest items like beds, couches and canoes. They don’t call it a holiday promotion, but the free shipping ends on December 21st, so it clearly is a Christmas gimmick. Steve Fuller, L.L. Bean’s senior vice president for corporate marketing, told the New York Times that they will lose money on the deal because shoppers typically buy less when there is no minimum purchase. I doubt that’s true, but even if they do lose a little on shipping, they’ll gain in loyalty and buzz. The Times reports that free shipping is intended to jump-start what stores expect to be a listless buying season, one dragged down by economic jitters. And one thing is certain – Bean’s free shipping definitely raises the bar for Eddie Bauer and its other competitors. Cool! LL Bean is usually really smart when it comes to their branding. I had the chance to go visit their HQs/store in Maine last month and was truly impressed with their concept and customer experience. I had a lot of fun shopping there so I wish them the best with their promotion. Hopefully they’ll break with the minimum purchase theory (I heard about it once before in a mkt. research class and didn’t convince me much either)…it’ll make for an interesting case study. LL Bean will never know if the promotion will make or lose money if they are offering it to everyone and have not set up test segments. Offering free shipping is an act of desperation if there is no way to evaluate the ROI. If they were to offer free shipping as a permanent policy and build the added costs into their margins, that would be news. Shipping is a profit center for most direct response businesses and has become an addiction. Free shipping as a policy could be a great a competitive advantage for certain types of businesses so I am surprised that I don’t see it more often. Interesting. With free shipping and (for me, in NH) no sales tax, it’s literally cheaper for me to order from them online than it is for me to drive to the store. Perhaps the ROI isn’t just in the shipping, but driving consumers to web/catalogue purchases, which have lower overhead costs than brick and mortar. If they can make more and more customers comfortable with online purchases, it will be profitable further down the line, long after the free shipping ends.